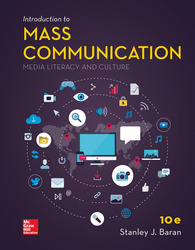 In today’s media rich world, Introduction to Mass Communication keeps media literacy and culture at its core. Using examples of the past to show how mass communications got their roots, and keeping current with the present’s emerging technologies and trends, Introduction to Mass Communication gives students a deeper understanding of the role media plays in both shaping and reflecting culture. By understanding and evaluating the ways in which media convergence is changing the landscape of media today, students are encouraged to think critically about their own roles in society as active media consumers.